Club Penguin Cheats by Mimo777 Club Penguin Cheats by Mimo777: Club Penguin Snow and Sports Catalog by Happy77, Whatever! 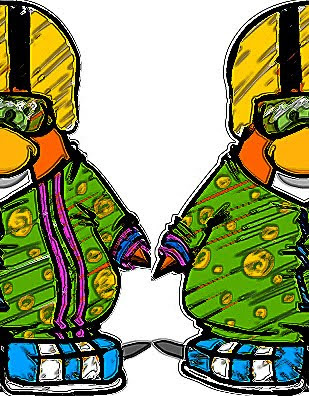 Club Penguin Snow and Sports Catalog by Happy77, Whatever! Freaky Club Penguin Candy Eating Costume that Doesn't Exist! BTW, I made it freakier! Q. How often do you make a new Snow & Sport catalog? A. Four times a year. We started to put the months on the front of the catalog so you'll see when the next issue is coming! Q. If there was a candy-eating sport, would any of you make the finals? What sort of outfit would you make for that? A. We'd eat our weight in candy and more! In fact, here's a sketch we just created that we think would be awesome to wear if there were a candy eating sport. This interview doesn't sound real to me. I know its just for fun, but sheesh. If I could make any kind of Club Penguin costume it would be an aardvark-lizard-astronaut suit! Don't forget, the Mimo Secret Builders Party starts tomorrow. Go check out the Mimo Club House. I started decorating it for the party! Also join the Mimo Fan Club! I cant wait for the new Sports catalog, I hope there is some new stuff! And yeah, those interviews are always so corny lol. ANd i dont get why they worked on designing that outfit when its not gonna be in the catalog anyway :/ oh well lol cant wait till friday! I wish they made the catolog monthly. But I'm really excited too. Congradulations Zxz192 for being the first one to post a comment! That's awesome. LOL! I can't wait! That's really freaky! That would totally awesome if they made this a sport. kewl awesome pic and post wow i love cpg i check it every day! that would be so awesome if that was in the catalog and we had it as a candy eating contest! It will be so cool when it comes! I wanna get the helmets! =D WOOOO! I can't wait for the new catolog! I really like Zo And Zurs idea! That would be cool if we could draw Mimo some outfits!! Maybe there will be a pizza eating costume too! wish they made the catolog monthly. But I'm really excited too. Congradulations Zxz192 for being the first one to post a comment! Congratulations to him for not writing 'first comment'! Lol. That ain't gonna happen! I'm the best at candy eating! We would have to get it into the catalogue first! Same, I thought it came out randomly! Unless they make donut eating a sport that is! Same I want one NOW! i cant wait for the new catalog, the costume i would make would be a panda-alien costume! Awesome! Can't wait! I'd make a Smelly Zebra Outfit. That would be awesome lol. Right? If only we could request it to Club Penguin. Congrats to ALL winners of the What's Different Contest! P.S I am one of them, too! ;)) Lolz. OMG! My favourite play -Penguins That Time Forgot- is coming back! On Sept. 11! Don't we all. They just don't have enough sports. I think there really are enough sports, just they wouldnt be able to come up with a different sport per catalog each catalog... I was thinking. Maybe lacrosse, handball, waterpolo, frisbee golf (:p) flag football. Good job! u got 10 of the ones correct! well i dunno if they r correct but maybe! These contests r hard. Like i said before i only got 4 ;) LOL!